Before every school day, students from Westlake Middle School line up in front of the 7-Eleven at the corner of Harrison and 24th streets in Oakland, California. On one morning in March — National Nutrition Month — four boys ate fried chicken and drank 20-ounce bottles of Coca-Cola minutes before the first school bell. Across the street, a Whole Foods Market offers healthier, but costlier, food choices. Peter Van Tassel, former assistant principal at Westlake, said the majority of Westlake’s students are minorities from working class families with little time for meal preparation. Often, Van Tassel says, students will grab bags of spicy hot chips and a variation of an Arizona drink for $2. But because they’re teenagers, they don’t feel any negative effects from what they’re eating and drinking. One-third of all children in Alameda county, like in the rest of the United States, are overweight or obese. in the United States are obese as well, according to the ). Some groups, namely blacks, Latinos, and the poor, have higher rates than their counterparts. However, the main contributor to empty calories in the Western diet — added sugars — doesn’t taste as sweet when looking at how it affects our health. When it comes to sugars, health experts aren’t concerned with the naturally occurring ones found in fruits and other foods. They are concerned about added sugars — whether from sugar cane, beets, or corn — which offer no nutritional value. Table sugar, or sucrose, is digested as both a fat and a carbohydrate because it contains equal parts glucose and fructose. High-fructose corn syrup runs at about 42 to 55 percent glucose. Glucose helps power every cell in your body. Only the liver can digest fructose however, which it turns into triglycerides, or fat. While this normally wouldn’t be a problem in small doses, large amounts like those in sugar-sweetened beverages can create extra fat in the liver, much like alcohol. 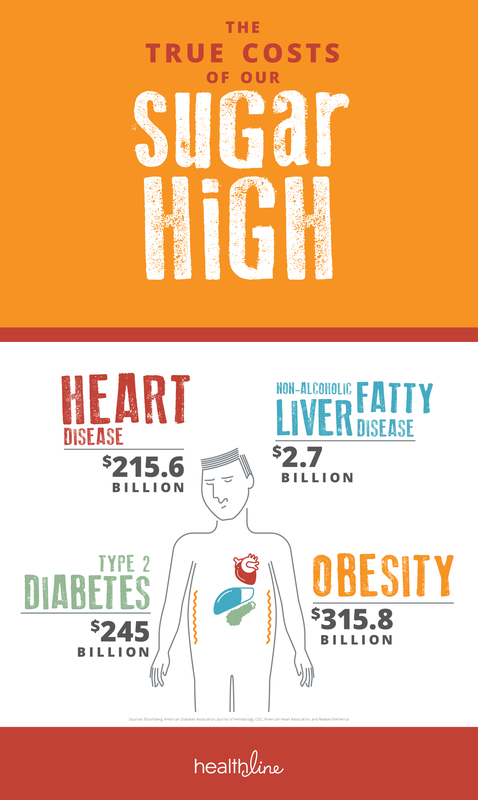 Besides cavities, type 2 diabetes, and heart disease, excess sugar consumption can lead to obesity and nonalcoholic fatty liver disease (NAFLD), a condition affecting up to one-quarter of the U.S. population. NAFLD has become the leading cause of liver transplants. Recent research published in the Journal of Hepatology concluded that NAFLD is a major risk factor for cardiovascular disease, the primary cause of death for people with NAFLD. It’s also linked to obesity, type 2 diabetes, elevated triglycerides, and high blood pressure.So, to obese children who regularly consume sugar, their livers are getting the one-two punch normally reserved for older alcoholics. Dr. Robert Lustig, a pediatric endocrinologist at the University of California, San Francisco, says both alcohol and sugar are toxic poisons that lack any nutritional value and cause damage when consumed in excess. And both have the potential to be addictive. In addition to the potential to be addictive, emerging research suggests that fructose damages communication between brain cells, increases toxicity in the brain, and a long-term sugar diet diminishes the brain’s ability to learn and retain information. Research out of UCLA published in April found that fructose can damage hundreds of the genes central to metabolism and lead to major diseases, including Alzheimer’s and ADHD. The evidence that excess calories from added sugars contribute to weight gain and obesity is something the sugar industry actively attempts to distance themselves from. The American Beverage Association, a trade group for sugar-sweetened beverage manufacturers, says there’s misplaced attention given to soda related to obesity. Those without financial gain related to sugar consumption, however, disagree. Harvard researchers say sugar, particularly sugar-sweetened beverages, increases the risk of obesity, diabetes, heart disease, and gout. When weighing evidence to make changes to the current food nutrition label, the U.S. Food and Drug Administration (FDA) found “strong and consistent” evidence that added sugars in foods and beverages are associated with excess body weight in children. The FDA panel also determined that added sugars, particularly those from sugar-sweetened beverages, increases risk of type 2 diabetes. It found “moderate” evidence that it increases the risk of hypertension, stroke, and coronary heart disease. As evidence of its negative health effects roll in, more Americans are skipping soda, whether regular or diet. According to a recent Gallup poll, people are now avoiding soda over other unhealthy choices, including sugar, fat, red meat, and salt. Overall, American consumption of sweeteners is on the decline following a rise in the 1990s and peak in 1999. Diets, however, are complicated issues to distill. Targeting one specific ingredient can have unintended consequences. Dietary fat was the focus more than 20 years ago after reports showed it increased a person’s chances of disease, including obesity and heart problems. So, in turn, many high-fat products like dairy, snacks, and cakes, in particular, began offering low-fat options, often adding sugar to make them more palatable. These hidden sugars can make it harder for people to accurately gauge their daily sugar consumption. While people may be more cognizant of the faults of excess sweeteners and are steering away from them, many experts believe there are still improvements to be made. Dr. Allen Greene, a pediatrician in Palo Alto, California, said cheap, processed food and its links to major disease is now a social justice issue. One of those resources is the correct information, Greene said, and that’s not what everyone gets, especially children. While it’s illegal to advertise alcohol and cigarettes to kids, it’s entirely legal to market unhealthy foods directly to them using their favorite cartoon characters. In fact, it’s big business, supported with tax write-offs that some experts argue should stop to slow the obesity epidemic. Makers of sugary and energy drinks disproportionately target young children and minorities across all forms of media. Roughly half of the $866 million beverage companies spent on advertising targeted teens, according to the latest report from the Federal Trade Commission (FTC). The makers of fast food, breakfast cereals, and carbonated beverages, all major sources of added sugars in the American diet, paid for the majority — 72 percent — of foods marketed toward children. 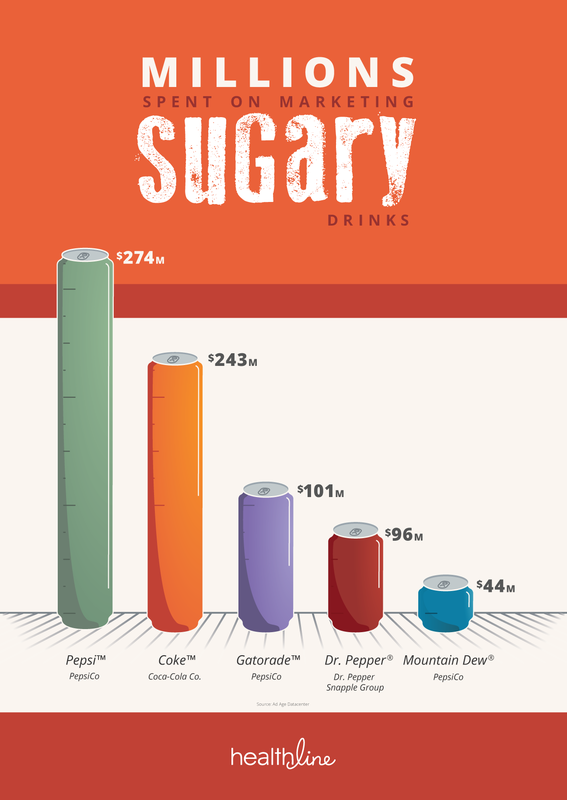 The FTC report, which was commissioned in response to America’s obesity epidemic, found that almost all sugar in drinks marketed to children were added sugars, averaging more than 20 grams per serving. That’s more than half the recommended daily amount for adult men. Snacks marketed toward children and teens are the worst offenders, with few meeting definitions of low calorie, low saturated fat, or low sodium. Virtually none can be considered a good source of fiber or are at least half whole grains, the report states. All too often, these foods are endorsed by celebrities who children emulate, even though most of the products they endorse fall into the junk food category. A study released in June in the journal Pediatrics found that 71 percent of 69 nonalcoholic beverages promoted by celebrities were of the sugar-sweetened variety. Of the 65 celebrities who endorsed food or beverages, more than 80 percent had at least one Teen Choice Award nomination, and 80 percent of the foods and drinks they endorsed were energy-dense or nutrient-poor. Those with the most endorsements for food and beverages were popular musicians Baauer, will.i.am, Justin Timberlake, Maroon 5, and Britney Spears. And watching those endorsements can have a direct impact on how much extra weight a child puts on. One UCLA study determined that watching commercial television, as opposed to DVDs or educational programming, directly correlated to higher body mass index (BMI), particularly in children younger than 6 years old. This, researchers said, was due to the fact children see, on average, 4,000 television commercials for food by the time they’re 5. Under current tax law, companies can deduct marketing and advertising expenses from their income taxes, including those who aggressively promote unhealthy foods to children. In 2014, lawmakers attempted to pass a bill — the Stop Subsidizing Childhood Obesity Act — that would end tax deductions for advertising junk food to kids. It had the support of major health organizations but died in Congress. Eliminating these tax subsidies is one intervention that could reduce childhood obesity, according to research published in Health Affairs. Scientists from some of the top health schools in the United States examined cheap and effective ways to combat obesity in children, finding that excise taxes on sugar-sweetened beverages, ending tax subsidies, and setting nutrition standards for foods and beverages sold in schools outside of meals were the most effective. In total, researchers concluded, these interventions could prevent 1,050,100 new cases of childhood obesity by 2025. For every dollar spent, the net savings are projected to be between $4.56 and $32.53 per initiative. “An important question for policy makers is, why are they not actively pursuing cost-effective policies that can prevent childhood obesity and that cost less to implement than they would save for society?” researchers wrote in the study. While attempts to impose taxes on sugary drinks in the United States are routinely met with heavy lobbying resistance from industry, Mexico enacted one of the highest nationwide soda taxes in the world. It resulted in a 12 percent decrease in soda sales in its first year. In Thailand, a recent government-sponsored campaign about sugar consumption shows grisly images of open sores, illustrating how uncontrolled diabetes makes it harder for sores to heal. They’re akin to the graphic labels some countries have on cigarette packaging. When it comes to soda, Australia bites back at bad advertising, but is also home to one of the most effective marketing campaigns of the 21st century. “Myth. Makes you fat. Myth. Rots your teeth. Myth. Packed with caffeine,” were the phrases the Australian Competition and Consumer Commission took issue with, particularly the insinuation that a responsible parent could include Coke in a family diet and not have to worry about the health effects. Coca-Cola had to run ads in 2009 correcting their busted “myths” that said their beverages can contribute to weight gain, obesity, and tooth decay. Two years later, Coke was looking for a new summer ad campaign. Their advertising team was given free rein “to deliver a truly disruptive idea that would make headlines,” aimed at teens and young adults. The “Share a Coke” campaign, with bottles featuring 150 of Australia’s most common names, was born. It translated to 250 million cans and bottles sold in a country of 23 million people in summer 2012. The campaign became a worldwide phenomenon, as Coke, then the world’s leader in sugary drink spending, spent $3.3 billion on advertising in 2012. Ogilvy, the ad agency that came up with the myth-busting mom and the Share a Coke campaigns, won numerous awards, including the Creative Effectiveness Lion. Zac Hutchings, of Brisbane, was 18 years old when the campaign first launched. While he saw friends post bottles with their names on them on social media, it didn’t inspire him to purchase a soda.